My last time on stage was in 2013. 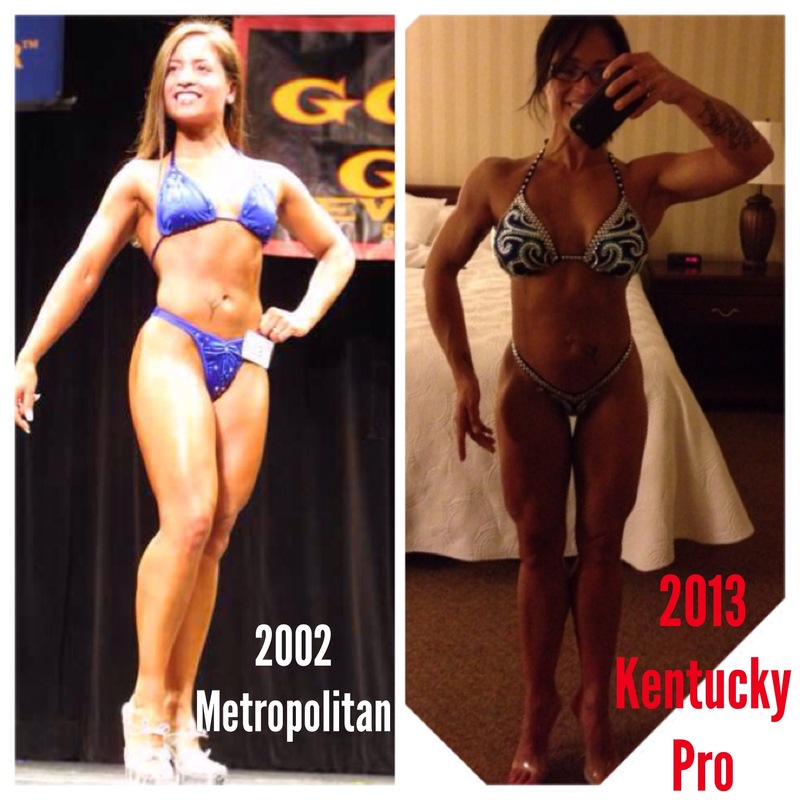 It was a roller coaster of a year for me as I made a huge career change, said goodbye to my favorite car (it died on me after 10 years), and I made my IFBB Pro Figure Debut… What a ride! These pics are some points along the way… April in the top left, November in the bottom right. 22 weeks and 25 lbs difference. This show was my first show as a Pro and might turn out to be my last. Although one never knows what the future holds, it is safe to say that going through one more competition preparation might do some major damage to my health. In 2010, I earned my pro status at the Team Universe show held in Hackensack, NJ. It was a momentous day and I really put my heart and soul into making my dream come true… What unfolded in the next few weeks post show was a nightmare I thought I would never experience. Extreme water retention, weight gain, cravings, gastrointestinal issues, irregular periods, aching joints, exhaustion… I went into hiding and hated leaving my apartment for anything. I had done major damage to myself by overtraining, undereating, and doing way too much cardiovascular exercise… 3 hours per day, 7 days per week for 9 weeks straight… No complex carbohydrates, too much protein, very low-fat… DISASTER! I worked with several doctors and hired a coach based out of Canada to help get me on track. We had success and after 6 months of working together, I thought I could try things on my own for a while, which I did successfully. By fall 2012, when I made the decision to change careers and put an action plan together, I had gotten my body to a place where I wasn’t hating myself anymore, but I was trying very hard to continue working towards the body, the image, the shape that I recognize… the one I feel comfortable in. Fast forward about 8 months… Now I’m a Personal Trainer working at a gym, running my online business Fit by Tiana, and coaching athletes with their stage presentations at local competitions. It felt like maybe I could saddle up and compete one more time. Maybe documenting my experience on social media would help build my following and also show clients, friends and supporters how transparent I am… which would ultimately help my business long-term. So, I jumped into another show prep with the help of a different coach. We took things slow at first, not a ton of cardio, eating a lot of food, training very heavy weights… A recipe for success, if you will. I knew this could be dangerous… being as I had already experienced countless doctor visits, MRIs, lab tests, detoxes, etc… I made a deal with myself…. … you look 5 months pregnant after every meal? … most meals make you nauseous? … you break out in hives or have severely dry skin? … your energy plummets (like way more than you’ve ever felt before) you can barely lift your arms or keep your eyes open? … you want to drop out of the show?….. but…… you don’t…. I went through with the competition… not feeling well… not looking my best… not confident… and ashamed of myself… for something completely out of my control. My body was not happy with me… and here I was having flashbacks and reliving similar bad experiences from 2010. Was there glory in finishing the process? yes… absolutely! Did my business pick up after the show? yes… it did. Did I secretly hate myself again for being foolish? YES! Those few minutes on the stage were glorious in some ways… but the price I paid was not. So, while I am very proud of what I have accomplished, and I miss the stage very much… I know my purpose is not to compete.. but rather to help other people who want to compete and to aid them in not making the same mistakes I made. I recently was told by an old acquaintance that she felt competing was “completely self-serving” and “nothing good comes out of it”. I would have to disagree wholeheartedly. I learned so much about myself through every single show I competed in from 2000 to 2013… and I would not trade that knowledge for the world. My clients are better served because of my personal experiences, good and not so good. The simple fact is no one forces anyone to do anything… we all make choices in life and we need to own them.